It's been a little bit rotten for cycling fans lately. Lance Armstrong's self-serving and not particularly revealing appearance on Oprah has once again focussed all the attention on the bad old days when cycling wasn't even trying to clean up its act and, as usual, people who have no interest in cycling at its best are eager to ask all sorts of questions about it at its worst. Its tiring enough for fans to answer all those questions, but for professionals whose answers will be subjected to extra scrutiny and suspicion it must be even tougher, so you can understand why Mark Cavendish and Bradley Wiggins have made some fairly sweary and outrageous statements on the matter. It would be quite easy to get sweary and downbeat myself, but actually, two things have happened in the last couple of days that have made me feel better about cycling. They aren't great big enormous events, just little things, but they've cheered me up a great deal. 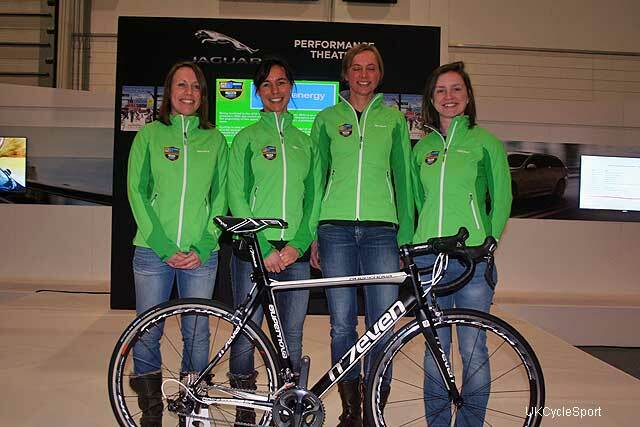 Firstly, CTC has announced that it's sponsoring a womens cycling team. Good old CTC. I've never encountered a more helpful bunch, they always go the extra mile. A quick phonecall to their office will pretty much result in them planning a cycling holiday for you, a visit to their forums will produce a library's worth of advice, and they know the location of every piece of decent coffee cake in the British Isles. Hardly surprising then, that they're stepping up to tackle one of cycling's looming problems, the under-representation of women. A couple of days ago I was lamenting the fact that Cyclist magazine had deemed Marianne Vos worthy of appearing on the cover of their subscriber copy, but had chickened out of putting her on the newsstand edition, presumably in case illiterate shoppers saw a woman on the cover and assumed it was the latest Marie-Claire. Mid-rant, however, it occurred to me that I almost never mention women's cycling on this blog, and I immediately decided to rectify the matter. No sooner had I mentioned this decision in a post than it also occurred to me that there's usually a fortnight delay between women's races happening and them being broadcast, and very little pirate coverage either. It might actually be a bit tough to find timely stuff to talk about, so the CTC's announcement has at least given me a head start. More importantly, of course, we'll get to see Team CTC's riders competing in the National Women's Championship and a number of UCI races. It's a small team, and a small thing, but it cheers me to see as solid a bunch as the CTC taking such a direct route to tackling the problem. The other thing that has cheered me up is the Greg LeMond's interview in the latest Cycle Sport. It's mostly a bleak re-cap of the bad years when Armstrong and his sponsors were aggressively arrayed against him, but it ends happily. In my back room, in a big chest full of old VHS tapes, there's a Tour De France highlights video in which LeMond gives an interview a few years after his retirement, and it's incredibly sad. He talks about feeling blocked, about leaving the sport feeling unfulfilled and about being unable to keep up with riders he'd previously been able to beat. He never mentions doping, in fact he seems bewildered by his inability to keep up, but from today's perspective its very difficult to watch the interview and not think that LeMond's career decline looked far more precipitous than it should have (no major wins after the 1990 TDF at the age of 29) thanks to the illegal boost enjoyed by so many other riders in the peloton. For years, that video has been what I picture when I think of Greg LeMond. A disappointed man, unhappy with the way his career ended, and not quite sure if he'd been cheated. It's incredibly refreshing to read this latest interview and see him described as enthusiastic, charming and sparkling, and to see him say that he still loves the sport. I often say that cycling won't completely clean itself up until all the old guard have retired. By old guard, I mean the Directeur Sportifs from the days before EPO, the guys from an era when doping couldn't win you a race, but could help you finish it. These guys tend to regard an attack on doping as an attack on the sports bottle carriers. With cycling's traditional heartlands being Northern France and Spain, Southern Belgium and Italy, anti-doping efforts were seen by some of these older riders and directeurs as a sort of class warfare, an attack on boys from poor, rural areas who worked hard for their team leaders. EPO and Blood Doping made a fallacy of that opinion, but there are still managers and riders who were raised in that environment, and the sport won't really be clean until the last of these guys have retired and taken with them the outdated belief that doping is a minor crime and anti-doping activities a major one. Now, having read that interview with LeMond, and been reminded of his willingness to speak out against Armstrong's involvement with Michele Ferrari, it occurs to me that there are some members of the old guard that it's very nice to have around.